Discussing methods for maximizing available energy, Energy Conversion surveys the latest advances in energy conversion from a wide variety of currently available energy sources. 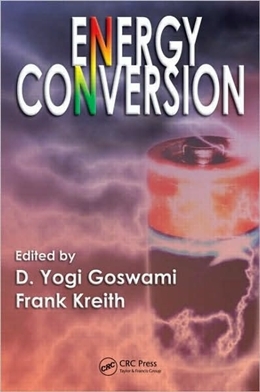 The book describes energy sources such as fossil fuels, biomass including refuse-derived biomass fuels, nuclear, solar radiation, wind, geothermal, and ocean, then provides the terminology and units used for each energy resource and their equivalence. It includes an overview of the steam power cycle, gas turbines, internal combustion engines, hydraulic turbines, Stirling engines, advanced fossil fuel power systems, and combined-cycle power plants. It outlines the development, current use, and future of nuclear fission.